Last Saturday, February 1st, author Robert Reed showed up on my Kids' EBook Bestseller List. His book, The Greatship, hit the number 5 spot in the Children's and Young Adult section of the Ebooks.com store. Good news--this week it's still there! Bob is an award winning author with over 200 professional writing sales to his name including 11 novels and many published shorter stories. He joins us today to share about his path to e-book success. First, let's find out what your book is about. THE GREATSHIP is an ancient, derelict starship larger than worlds and as old as the universe. Found drifting between the galaxies, humans claim it as their own, and in the tradition of doomed voyages, they set out on a tour of the Milky Way. The book is a collection of previously published stories, partly rewritten and arranged in some vaguely meaningful order, with new material strung between each standalone tale. I have published science fiction for nearly 30 years, with well over 200 short fiction titles and almost a dozen novels to my credit. Everything felt traditional, right down to the difficulties of being a mid-list author in this world. I wasn't getting interest in any new novels. 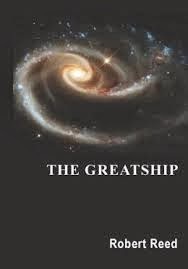 THE GREATSHIP began as a personal project, an attempt to make sense of a series of connected, prepublished stories inside a universe that I own and that I know better than anyone else. I considered an e-pub route. I didn't know anything about the process and put the manuscript aside. Then my agent and agency made arrangements with an e-publisher. "Do you have anything to offer?" I was asked. Yes, I did. Which means that others have done most of the work, outside of the actual writing. I still know almost nothing about e-publishing. As it happens, I also was working on a YA novel in the same Greatship universe. And it has sold, along with two sequels, all of which are on the traditional shelves in March, '14. THE MEMORY OF SKY is a trilogy in one volume, published by Prime Books. It too will be available as an e-book. "Target audience" implies a gun. I have no gun. I wrote what interested me, in a universe that has proven to be my most popular by a long stretch. That's as far as my marketing-mind could reach. My working assumption is that a set of popular stories, put together and with fresh material, might entertain my nine or ten fans around the world. I work at home, I work most days. Right now, I'm doing some contract work for a game company, which is nice, since they pay well and the work is usually challenging/fun. I also have a story about cyborgs due at the end of the month. And in my head, I'm working on a sequel to THE MEMORY OF SKY. I have many opinions, conflicted and uninformed opinions. But undoubtedly, I find that being freed of the need to satisfy a book editor and a publishing empire is a blessing. I can write what I want to write. Learn more about Robert Reed and his books by visiting his website or by following him on Facebook. And don't forget to check the updated Kids' EBook Bestseller List for the latest top ten authors in the top online stores. A Tale of Two Sisters - Two Weeks - Top Ten!